I was at a bit on a quandary this week, after my last session at Todber I was looking for another busy session. That being said, I was feeling decidedly lazy this morning, and my choice rested on a coin toss between Revels and Higher Kingscombe. 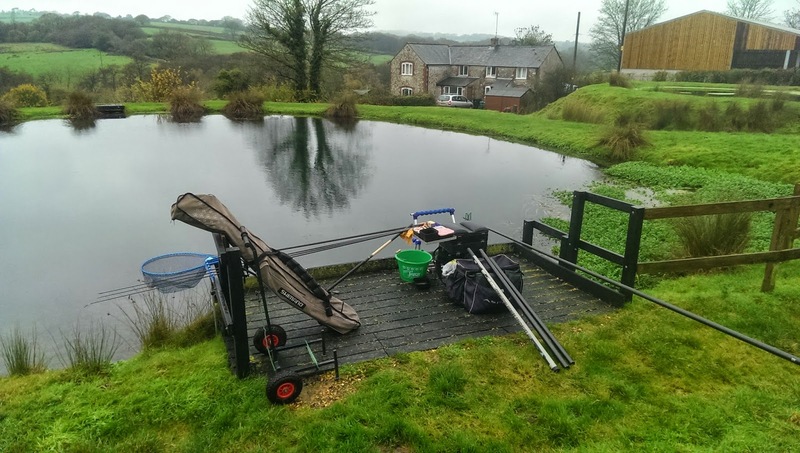 After my last action packed trip, I tossed the coin (heads) and packed the car, and made my way to Higher Kingscombe Fishery – Lodge Lake. This is a great fishery, and I really should try some of the other lakes as there are about 7 to choose from. The fact that the lake has official BDAA pegs meant choosing where to fish was an easy affair, and I hopped onto the peg I fished last time. After all, if it isn’t broke, why fix it? Parking up and having a quick chat to 2 Dorchester members we were astounded at the colour on the water. Despite recent days and nights of heavy rain it was gin clear. Not what I had anticipated. It was also very weedy! Still, I was not peturbed by the foliage or the crystal clear water, I set up and plumbing up I watched a shoal of solid Roach and Rudd lazily swim under my pole and out into the middle of the lake. I also saw a number of big carp amble past. Atleast I knew the fish were there, but I really wished I had polarized glasses. The glare on the water mean’t I couldn’t see more than 4 or 5 meters out, but an occasional lump could be seen swimming out parallel to my pole. Hindsight is a wonderful thing, and I now regret bring lazy. 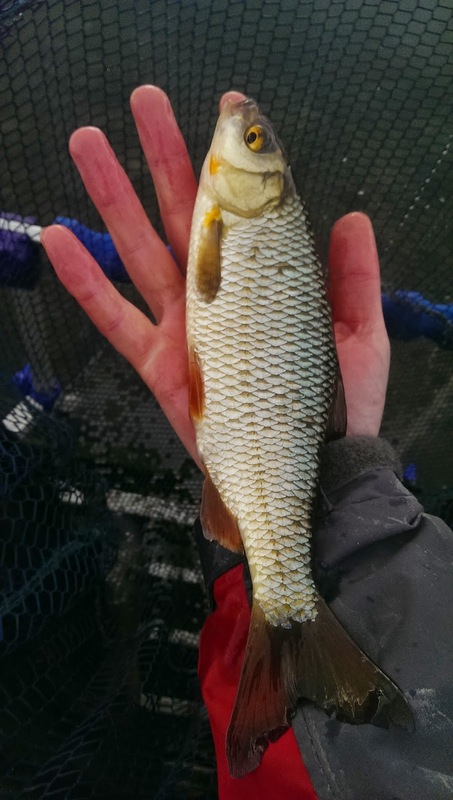 I should (on seeing the water clarity), have set up a waggler, as the pole was definitely spooking the fish, but I foolishly left it in the bag for the entire session. Margin swim at 7 meters – Middy carp float – 4.12lb straight through to a Size 18 QM1 band. Open water – Up in the water rig at 7 and 9 meters – NG 0.3g float 3lb line 16 Kamasan 16 B911. The water was quite cold, so I decided to take a negative feeding approach to start. Shipping out on double reds to test the waters (whay!) the float settled and after a few seconds it slowly made its way off to the left – I was in to Roach of an ounce. Maybe the water clarity didnt put these fish off… Maybe. There were fish topping everywhere and after the initial fish I had a good 5 – 10 minutes of nothing. I switched to the shallower set up and registered a bit straight away.. Missing it. A small pouch of maggots over the top and again another bite, but again I missed it! Without wanting to make excuses the wind was a constant easterly and would occasionally swirl to a northerly. The easterly really killed off the fishing and after 30 minutes and 2 small fish I was beginning to wish I had gone to Revels. 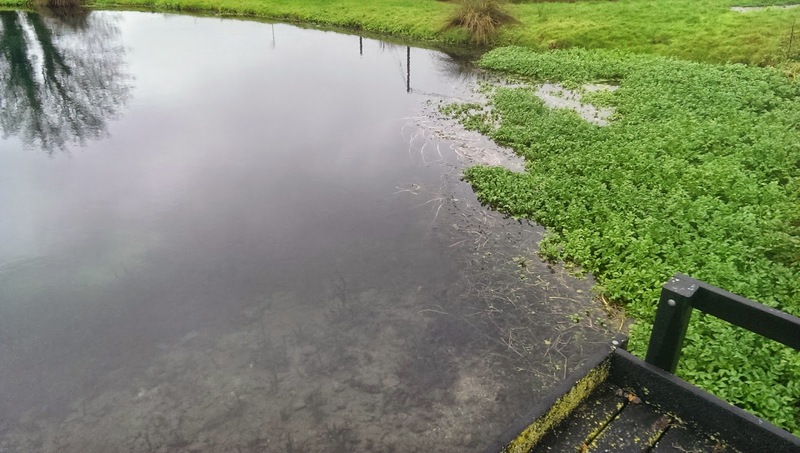 I dumped in 2 balls of micros next to the lillies and within a few minutes I could see little fish jumping around in the swim. I moved the same rig over to the margins and hoped not to snare a lump. The float bumped and twitched and after a few minutes it slid away! 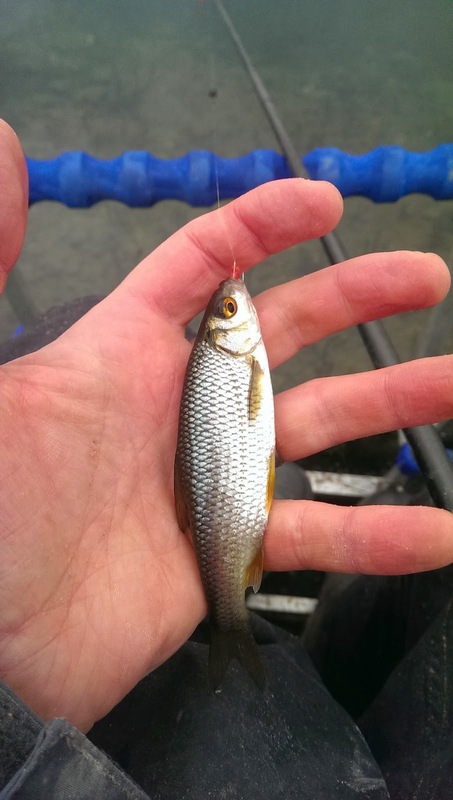 I was finally in – another small roach. I threw in a small pouch of 4mm pellets and watched a shoal of Rudd move in. I shipped out a banded 6mm halibut pellet and instantly had a lovely 3 lovely Rudd, one after another. The one looked a bit worse for wear, poor bugger, I think it may have narrowly avoided a beaked death quite recently. 3 fish was all I got out of that shoal and they all swanned off around the bank and towards the other side of the lake. This fella had been in the wars! It was a tough few hours and involved switching between open water line and margin line every 30 minutes or so to keep the bites coming. 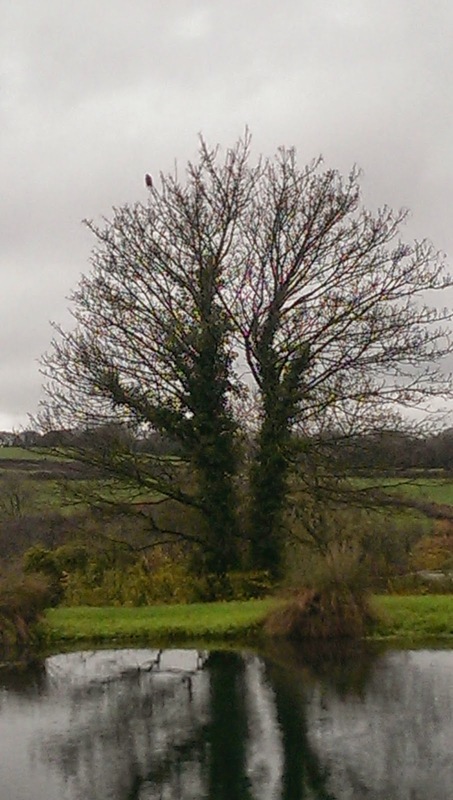 At one point I did have the company of a large bird of prey which sat in a nearby tree watching the fish. One of the Dorchester anglers came over mid way through the day and said he had managed one carp off the surface to pacify his curiosity that they could still be could like that this late on, but otherwise it was an incredibly slow day. He stood and talked for a while, and with his polarised glasses pointed out loads of fish in my open water swim. He seemed to be in the same situation, today the fish were not playing ball. 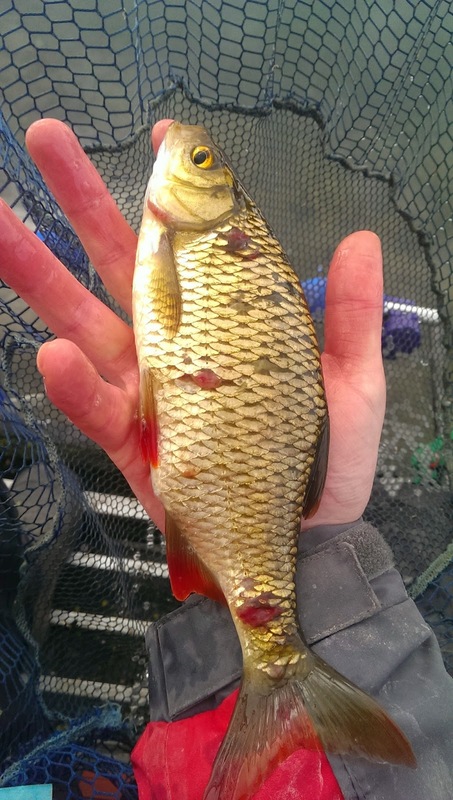 I managed a few roach and perch while he watched but it was slow going. I decided to go heavy (before going home) and pumped in 3 snooker ball lumps of micros and went for a quick walk around the lake. 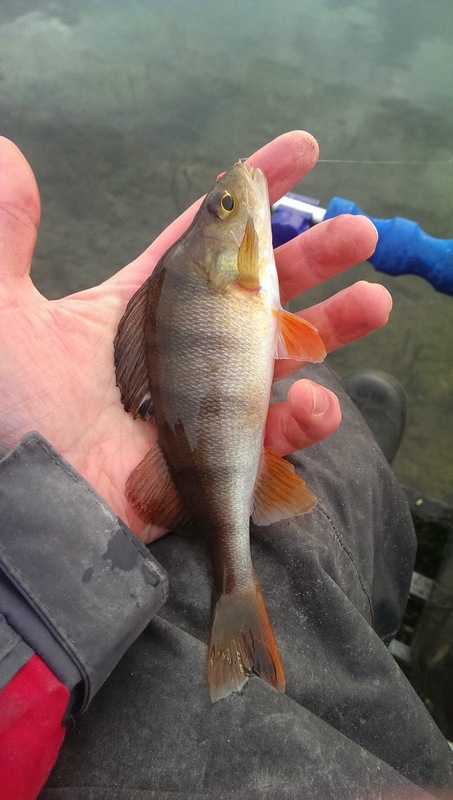 The Perch are rumoured to go over 4lb in this lake. By the time I had walked to the corner bank, I could see loads of little fish head down in the groundbait (but nothing of any great size). After 5 minutes I sat back down and shipped out, this was by far my best spell of fishing. I had to position my rig as close as possible to the weed growth, but hold the pole directly over the foliage so the fish couldn’t see it. I tried lengthening the line between the end of the pole and the float and holding it to left, but bites very quickly dried up. Only holding the pole over the reeds did the bites become more consistent. A solid hour followed and feeding every 2 or 3 fish seemed to be doing the job. 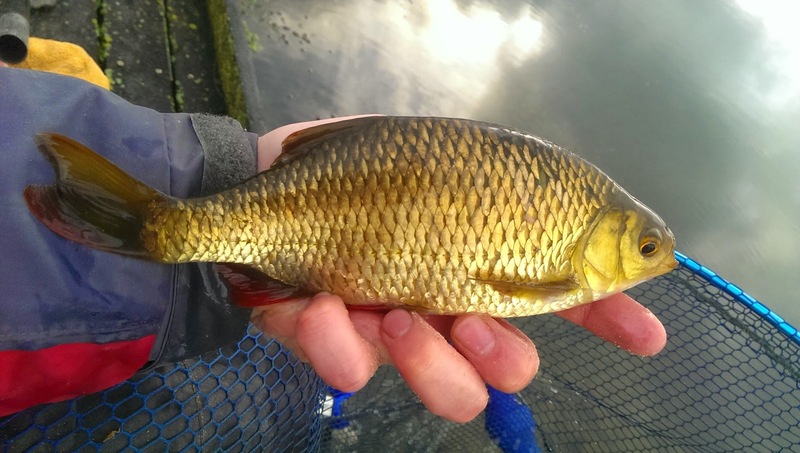 The fish in the lake are generally in immaculate condition and a good size all averaging over 8 ounces. 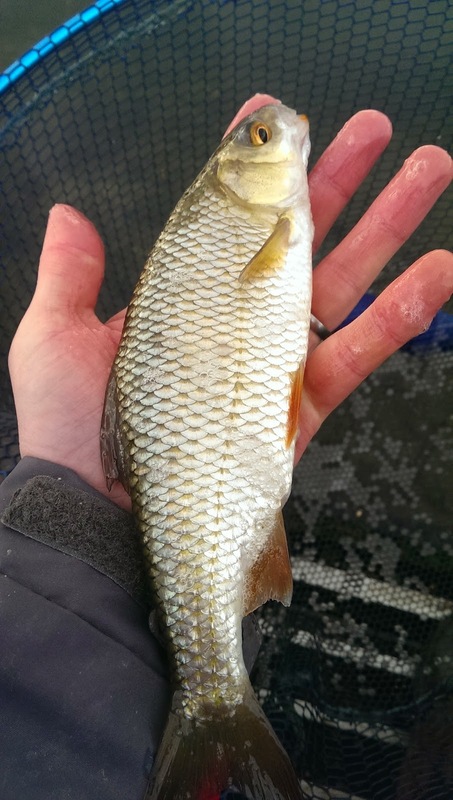 If the fish stuck around you could do a huge bag of quality Roach and Rudd! 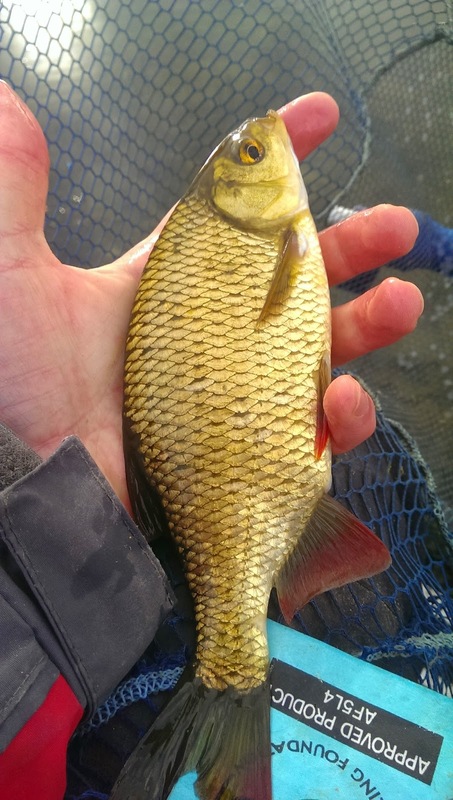 After an hour of steady fishing I had roughly 7 – 8lb of fish, coupled with a few lb that I caught earlier meant I would probably have squeezed into double figures. 3pm came and went, and the temperature was really beginning to drop, to the point where I could see my breathe! My last half an hour consisted of small fry again and I knocked the session on the head at half 3. Several times throughout the day (fishing in open water) I watched carp swim towards my pole, only to spot it, and turn sharply left and head out into the middle of the lake, never to be seen again. As I said previously, I should have switched to rod and line, and maybe that would have made more of an impact, but I think it was a difficult day for all. I really can’t fault the venue for comfort, the pegs are well spaced and comfortable, but by the end of the day I did regret not travelling that extra 10 minutes to get to get Revels. Still, I can’t complain as I was out catching a few fish! I’m not sure where I’ll be off next time, but hopefully it will be a trip back to Todber with my father in law, for some more margin mugging! For a rating, please read here. Previous story Trip #67 – Todber Manor – Whiteposts.